what if you could experience it using another one of your five senses, sight? BrighTTone is able to connect surround sound with color waves to create a unique music-listening experience bringing a visual element to a party, casual gathering, romantic evening or just a night at home by yourself. 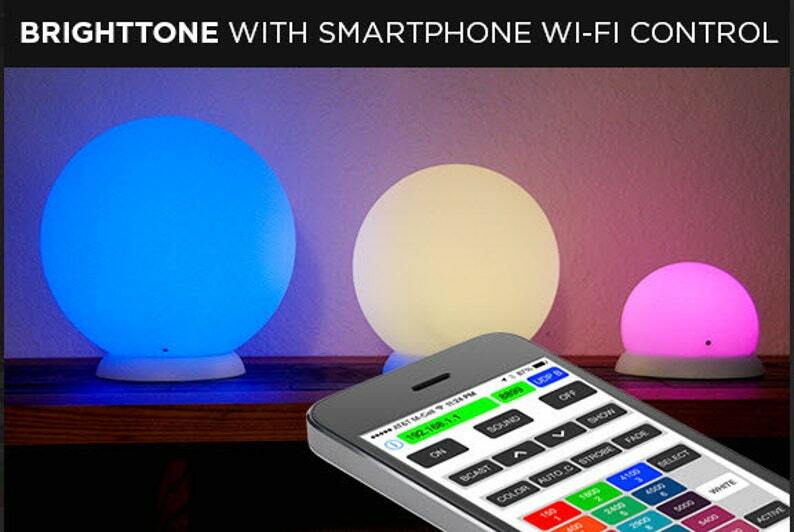 BrighTTone can be used by music and gadget enthusiasts, business owners looking to add a unique flair to their space, as well as professional musicians, as part of a live event or show. Use BrighTTone indoors or out - door. Sound-Activated: Brightness of the selected color is determined by the selected frequency presneted in the external sound that comes through the embedded high sensitivity microphone. In order to support different volume levels of the surround sounds, the device is equipped with an embedded automatic gain control circuitry (AGC) as well as with manually adjustable signal amplification, so the user has many ways to control brightness and colors dynamic. BrighTTone can be used in a single or multiple displays installation and the whole set can be controlled from a smart phone application using unicast or broadcast control. Both iPhone and Android Applications are provided FREE! When not in used for an extended period of time (1.5 hours +), BrighTTone will switch Off automatically going into deep sleep mode and will require pressing the button at the bottom of the Display in order to activate it again. The same button can be used at any time to switch the Ball Display Off (just hold down for 3 seconds). You can also hold this button down for ten seconds to reset the display to the factory default state and if you press button 5 times during 10 sec you will reset internal WiFi module to the factory default as well ( thsi is very useful if you made a mistake while configuring WiFi and then lost access to the device. So you have many way to recover from unexpected situations! (AUTO-3), medium ( “AUTO-2”) and high (“AUTO-1”). Based on the common sense, sound level or music type, the user can try one of the three auto calibration level scales to make the best representation for the brightness and colors dynamic. After auto calibration is completed, you can always adjust the signal level manually using Up_Arrow and Down_Arrow buttons.